The reason why is pretty gross. Do you have that one friend who insists you never step foot inside his/her home with your shoes on? OK, so that friend is probably your mom, but it turns out she was right all along—and not just because she's protecting her precious carpets from your mud tracks. 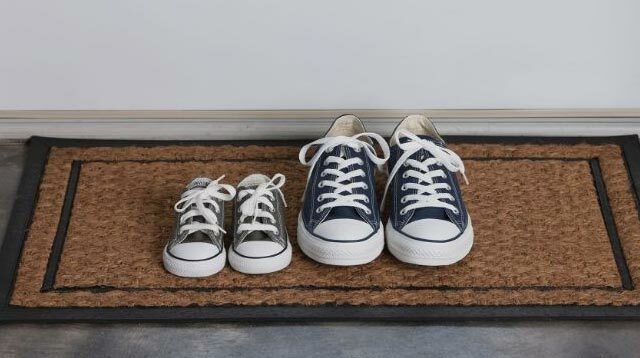 A new study led by Dr. Kevin Garey at the University of Hoxton has revealed that we all should be leaving our shoes at the front door after all. The study found that the soles of our shoes are basically one of the dirtiest things around, carrying all kinds of pathogenic (bad) bacteria. And the one we should be most worried about—Clostridium difficile, which can lead to some nasty bacterial infections—is actually present on 26.4% of shoe soles. Ew. The study found that the best way to keep a clean and hygienic house is to leave the shoes at the front door so that the bacteria doesn't get spread as you walk around. Oh and if you're thinking as long as you scrape them on the mat before you walk inside you'll be fine, don't be so hasty . "[…] you have to think of the person who wiped their feet before," says Dr. Garey. "You might be picking [up] stuff they left behind."